The Official Souq.com App! Souq.com Free Windows Phone app allows you to browse and buy online all shopping categories like: Mobile and Smartphone, Laptops and Tablet deals, Original Perfumes, Digital camera sales, Original watches at a discount, Sporting goods sales, Fashion and Makeup Deals, Shoes and Kitchen & Dining sales. If you live in the United Arab Emirates (UAE), Saudi Arabia, Kuwait or Egypt and looking for the best daily deals and best discounts in any online shopping website or app then Souq is the answer. Souq.com application allows you to pay using various payment methods, pay cash on delivery, pay online using your credit card, Visa, Master Card, Paypal or even by redeeming Neqaty loyalty points. You can check for and compare products' prices in your country. Share the hottest deals with your friends via Facebook, Twitter or even Whatsapp. 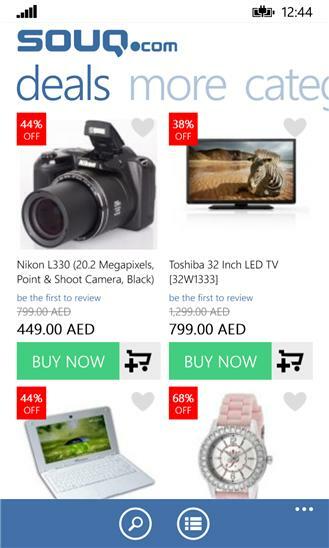 ---------------------- With Souq.com App you can: - Search, Browse, and Buy latest offers at unbeatable prices - Shop “Deal of the Day “offers - Track Souq orders - Edit your profile and change password - Manage your address book - Save products to your wishlist‏ Major Sales He Sale She Sale with heavy discounts Mar 28-31. 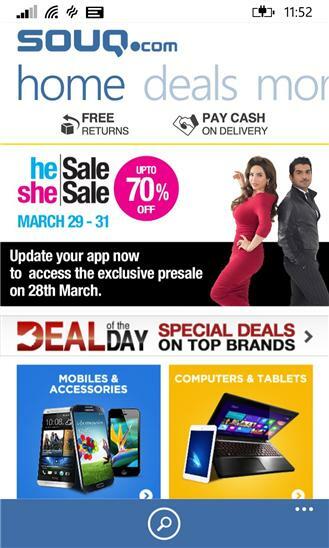 Exclusive mobile only preview sale on Mar 28th. Download/Upgrade the app to benefit from great offers during the sale. These will not be available to users on older versions of the app. So upgrade now and don't miss out on the attractive deals.